What we do not understand is that this lets others get access to your privacy which can be either accidentally deleted by friends or family, or even manipulated by someone else. Hence, it is a good practice to keep your folders password protected so that your data is safe and secured. While you do have the option to hide the folders in Windows operating system, it is of no use as the folder can be searched or unhidden. Hence, those who want to password protect their data they are forced to seek help from third-party software. So if you want to protect all your stuff in a jiffy, you can use some good applications to encrypt them. There are many applications out there that help to lock your folder, however, most of them are paid versions. Today we have compiled a list of some of the best free software for folder lock just for you that will help you save your drives on your Windows platform. So let’s get going. If you have a large quantity of data then you definitely want to secure it, and Folder Lock is one of the tools that helps you to achieve that. It helps you to lock and hide your files, folders, and drives by password protecting them. In addition, it also encrypts files, folders and email attachments, while it safely backs up your data and also safeguards your CD and the USB drives. It doesn’t stop at that, as you can also create wallets to store your credit card details and other personal information with the help of Folder Lock. It prevents your data to be accessed by even the smartest of hackers and the spies with the hotkey-activated secret mode. Clean history and shred junk files with Folder Lock and try all the benefits for free for the first 30 days post which it costs $39.95. One of the best choices of a folder locker goes to the IObit’s free Password or Protected Folder which is user-friendly, captures less disk space and offers a solid elementary protection for your files and folders. With IObit you can hide your files and folders from any outside access. While all outsiders are blocked to access your data, they cannot even view it in your absence. It offers an extremely simple dashboard where you can just drag and drop your preferred data to be locked. Additionally, the program also keeps itself secured by password protecting itself so that no one can uninstall it either. Even though IObit’s Password Folder is a free application it is completely free of malware and viruses. Even though the developer has shelved the project meaning that there would be no updates to the product, you still have the option to download the archive Lock-A-Folder application for free. It is a user-friendly software that takes up a small disk space and helps you to lock or hide any private folders on your PC or laptop. This action blocks other users to have access to your files and makes your data invisible. You need to create a master password to select the folder you want to hide or lock. Simply click on the option to make them invisible. You can again enter the password and select the desired folder to unlock it. Even when you need to uninstall the application, you need to enter the master password which means that no one in your absence can uninstall the tool without the password. A free encryption software, Safehouse Explore helps to maintain the privacy of your data by protecting them with passwords. It effectively covers your data from snoopers or anyone else who should not have access to it. With passwords and strong encryption of maximum 256-bit to make your data disappear completely from the outside world. From photos, videos, delicate files, spreadsheets etc. to any kind of files, it protects and hides your data completely. It can also defend the data contained in your USB and CD drives, memory cards, iPods and even network servers. It allows you to access your files only when you enter the password, which also makes it safe from external forces. 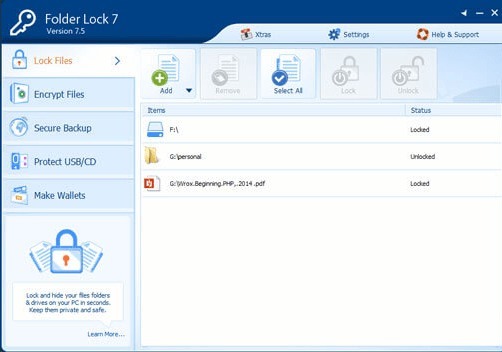 Easy File Locker is a free software that is user-friendly and lightweight. Perfect for Windows operating system, this tool helps defend your files and folders from getting lost or stolen. It provides solid protection to your data that is secured from other users and blocks them to view, open, read, change or remove info, copy or even move folders. The files or folders are completely hidden from being seen by any other user or spy program. 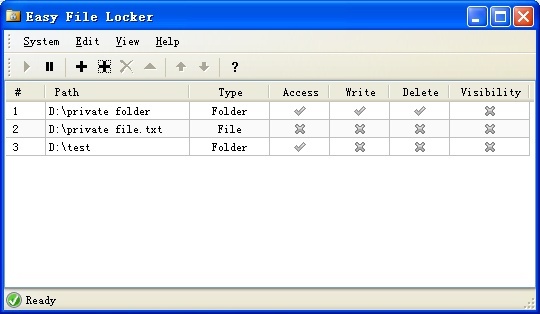 Easy File Locker is developed to protect your private files and folders on your private computer. The best part is that it does not slow down the speed of your system, does not modify or damage any data on your protected folders. 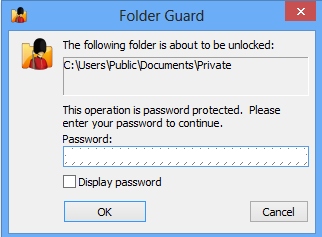 If you have decided upon hiding your private files and folders from outside users, password locks your data, limit access to Control Panel, defend the files in the system from getting destroyed and to control access to files, programs and folders to different Windows resources, then Folder Guard is the right choice for you. While you can specify to restrict access for which type of file, you can also create “read-only” files with Folder Guard for other users or viruses and restrict them to damage or modify your data. It is a lightweight application that barely takes up any space and protects your private data efficiently. Moreover, with an extremely user-friendly interface, it makes the entire process super easy for the user. With Private Folder, you can effectively hide or lock your private folders using a password. 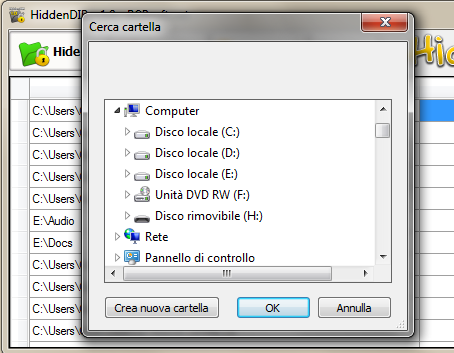 Any folder which is hidden can be accessed only by the owner who can get into the folder manually without even un-hiding it and using a configuration tool. Locked folders can be unlocked only with Private Folder configuration software else it cannot be accessed by unknown users. When conjoined with the Hide folder option, it will create a robust protection that will hide the folder completely. If you try to find a file in this mode, it will come back with a prompt saying “windows cannot find..” rather than the usual message that says “access denied”. Furthermore, you can get access to the hidden files only if you enter the correct password. Also, the lock automatically resets itself when you have mistakenly left the folder unlocked for more than two minutes. Some of the unique features of the Private Folder is that when the name is changed for the folder or it’s root the rule will automatically fine-tune itself to display the changes while the files are still locked and hidden. There is no limitation to lock files and folders. 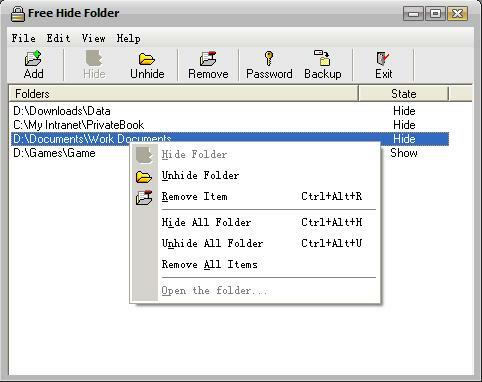 As the name suggests, Free Hide Folder is a free software that helps you to hide a list of private folders. While it prevents your sensitive data to be accessed by outside users, they will also not be aware of the existence of your personal files and hence, will not be able to see them even accidentally. The software provides password protection to your folders which can be modified or deleted at any given time. Free Hide Folder is easy to use tool that works with just a few mouse clicks. Open the tool, find the folder you want to hide, select it and then finally click the option that says “Hide Folder” to simply hide your private folders. Unless the folders are unhidden by the owner, the folders remain hidden completely. While you run the program the folders are password protected and require no change in the file system. You can hide a unlimited number of files with Free Hide Folder which is completely free of any viruses, ads, or spywares. With Instant Lock you can rest assured that your piles of data will be locked and protected in a matter of seconds. There are many ways by which you can lock your data that is, either by using the add button inside the app, you can drag and drop the folder, simply drag the folder to the application link, by entering the command line like, “D: New Folder” or by just right clicking the mouse button the desired folder and choosing the option “Lock”. Instant Lock ensures that no has access to your files and folders even if your laptop is stolen, and neither can anyone uninstall the tool except you who can do so using the password. The best part is that even if the data is deleted accidentally or by someone, you can simply re-install the app with the same password and you have your folders back! That’s not all, as you can also protect your USB drives, CD/DVD drives, or Flash Memory drives by suing a password. Moreover, it also allows you to defrag and ScanDisk effortlessly, however, remember to unlock all folders and backup your locked folders before you carry out the action. Compatibility: Windows 95/98/ME/NT/2000/XP/Vista/2003/2008/2012, Windows 7, Windows 8, Windows 8.1 and Windows 10; for both 32 bit and 64 bit editions. 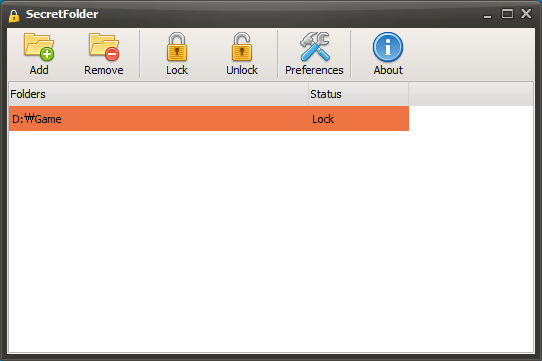 Secret Folder is a freeware that’s created to protect your private folders with a password. Even though the interface is elementary, it is extremely user-friendly and straightforward. Once the folder is safeguarded with SecretFolder it will not be visible in the File Explorer. The best part here is that users will not have access to these protected folders even via the Command Prompt which makes it a unique feature. Even when someone wants to uninstall the program he/she needs to enter the password to perform the action. This also means that no outsider will be able to access your protected folder on your PC without the password, uninstall it or reset the password making it an extremely safe and secure option. You can protect unlimited files or folders of any size and the fie systems that are supported by the SecretFolder is FAT, FAT32, exFAT and NTFS. You can either add the folders to hide and protect by cling on the Add button or simply drag and drop the desired folder to the app window. If you want to unlock the folder you need to open the tool, key in the password and then just click the Unlock option. You have the option to change the language and the password under the preferences section. HiddenDIR is another great tool which is not only free of cost but also defends your privacy by hiding your private folders in just a few clicks. Once hidden, the folders are invisible to others users and inaccessible by anyone. The folders which are carefully hidden by the software will be visible only if you have the password to the directory or the USB drive where it is saved. You simply need to click the “Hide” button to hide the folder and make it invisible, while to unhide the folder and make it visible by selecting the desired folders and check the option “select to unhide” and there you go! Above all, you need to set a password that will be prompted to enter when you want to open the application. File and Folder protector is another free folder security software that helps you to safeguard your sensitive data with a robust password protection option. This step does not allow any outsider to have access to the files except the owner. You can activate protection from the main dashboard and simply select the desired folders to be locked. It allows you to select multiple items at a time post which you can start the protection procedure. You need to now create a strong password which is customizable, so you can edit it any given time. Once the data is protected no one else except the owner can access the locked data from Windows or via the MS-DOS search option. Protect Folder is a compact and lightweight software that does not occupy much of your computer’s space. It helps protect your personal folders and also encrypts your sensitive files, folders and other portable devices with a strong password which can be again unlocked with only hotkeys. If you prefer using ZIP archive security, then you should try Protect Folder instead and feel the difference. This application can be quickly installed and uninstalled and it also has the feature to lock the directory automatically when the time is over. Among its other features are, the facility to direct the files and folders to the safeguarded directory, and the ability to provide robust protection. Protect Folder also comes with a clean and light-weighted dashboard and also helps protect any of the removable drives and their directories. Price: Free for limited period after that it costs $34.95 per copy. Compatibility: 2000/XP/Vista/7/8 and Windows 10. Kaka Folder Protection is a compact and portable software that helps protect your sensitive data by password locking them. Your private files and folders are secured with the current 256 bit AES encryption technology. The best part is that you can usually open the tool directly without even installing it your workstation. You can simply copy the command “Lockdir.exe” to a drive or folder and simply run it to lock the folder with a password. The passwords used are exclusive, so you can rest assured that your data is safe from being changed, removed, misused or moved. You can protect your precious files and folders with just a few clicks that restrict it from outside view and access and also prevents your data from being tampered or deleted. Folder Protection also protects your removable drives like external hard drives, memory cards, USB drives, pen drives etc. with a password. Advanced Folder Encryption is another offering by Kakasoft that helps lock your private files, folders, and hard drives in just two simple steps. It allows you to lock folders instantly with the military standard encryption that is, 256 bit AES. It is a highly user-friendly program that provides top-grade security for your sensitive data on your PC or Laptop. It offers an extremely simple interface where you can drag and drop a file/folder to be protected. You can then set up a new passcode and once done your protected files or folders will instantly change into protected icons. You can also simply right-click on the folder and choose the option “Encrypt” to protect your folders in a second. Additionally, Advanced Folder Encryption also allows you to shred files and even permanently delete any junk files from your computer that cannot be recovered. The tool directly integrates with Windows Explorer and helps encrypt files and folders, view and edit them, and even decrypt them in just a few clicks. If your aim is to simply hide and protect your folders, Lock and Hide Folder can be the right bet for you. By simply clicking on the “Hide” button you can hide the selected directories. Even though this tool has comparatively fewer features than the others in the category, it is one of the best options if you want to just protect your directories. It hides your sensitive files in such a way that neither can it be viewed by other users nor can it be accessed. Your hidden files cannot be even traced with links in your current documents once protected. For additional security, you can set a password so that no one else can access your files. This app can also run in stealth mode making it invisible to other users. You can also use hotkeys to activate or deactivate the hidden folders to be visible. Lock and Hide Folder works on 256 bit Blowfish Encryption. folder lock 7 is best one i think. I tried Private Folder from eMing Software Inc. Very simple and very useful program. Thanks!